Lately I’ve had quite the thing for fictional frogs – not the frogs who turn into princes or have just been princes, although those guys are pretty great too. But no, a thing for the hoppy, happy, stretchy, leapy unpredictable green frogs that make the books they jump into particularly delightful. I just found this book at my local library. 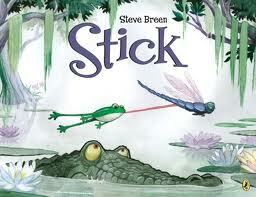 Stick is Steve Breen’s first picture book (but his talent for words and visual images has not been missed – he won the Pulitzer Prize for his editorial cartoons twice!) How far can one little frog travel? And how? Find out what happens when little Stick happens to get his long tongue stuck to a dragonfly. Up, up and away . . . Silly, delightfully preposterous and gorgeous bird’s (in this case frog!) eye view of town, city and swamp. I kept eyeing this book at the library, noticing names Mo Willems and John J Muth and thinking to myself, “I have got to read this book.” Something about the cover picture spoke dog to me and I kept missing the frog, even when I eyed the title I saw dog instead of frog. Finally, I looked a little closer and spotted the frog so perfectly plopped on the dog’s head and I pulled the book off the shelf. How could I have missed this? I was missing so much! Inside illustrations are mellow, gentle and ahh, what greens. Together with Willems’ simple text, pictures and words tell the tender story of friendship, the passage of time, young curiousity and calm wisdom. To make up for the months I haven’t been reading this book, I need to read it over and over and over again. 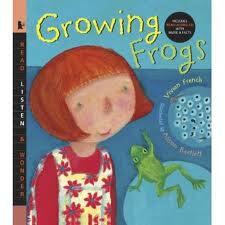 Such an amazing book to teach about how frogs grow from tadpoles and how exciting this change can be to watch. I call a book like this an “information storybook” – a definite fictional story yet so much factual information it bridges into the non-fiction category. A little girl and her Mom collect frog spawn from the pond and carefully tend to the tadpoles, then frogs who grow. This book took me right back to my eight year old self and my ice cream bucket full of pond water and tadpoles. How I loved it and how sad I was to return my little frogs to their pond again. I love that French points out how carefully you must care for your growing frogs – always using pond water, changing it regularly etc. Allowing children to have important nature experiences respectfully. 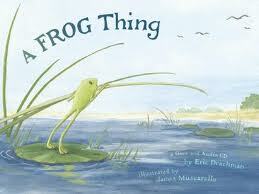 I have a real soft spot for Frankie the frog in this story. Told by his parents that he can do anything, he sets his mind to flying. Ahem, darling, “that’s a bird thing” explain his parents. He does try very hard to soar through the air but to no avail. One day he sees a baby bird fall helplessly into the pond and swims to its rescue. The grateful mother demands – “How can I repay you?” Well . . . We soon see Freddy flying through the air clutching a twig held by two birds. Finally flying! Exciting, yes. But Freddy realizes that doing the frog thing will suffice for him after all. Beautifully illustrated. A wonderful read aloud to share. Wow, is it great to be a little frog. Having Mama frog all to yourself. Sigh. . . happiness. So what are all of these black spotted blogs in the water? Why do they have tails? Now legs? Oh my! Little frogs. All belonging to Mama. Life with many new siblings is quite the adjustment for our little frog. Annoying at first – how much leaping and tumbling about can these little frogs do? 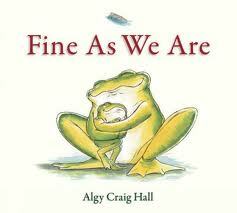 But then, oddly “just right.” The perfect book to explore how life changes when a new sibling (or siblings) arrives. Jealousy is just a stage, right? 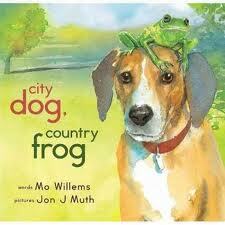 Hop through some frog books this Spring! This entry was posted in Picture Book Love and tagged favourite illustrators, friendship, frogs, great read alouds, information story books, John J Muth, Mo Willems, nature, picture books, Steve Breen, Vivian French by carriegelson. Bookmark the permalink.